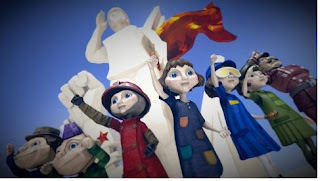 The adventure video game “The Tomorrow Children” looks stunning but when it comes to what to do in the game some players can get confuse easily. What is the goal of The Tomorrow Children? However, this is easily explained. The goal is to build a working city where people can live. The game is about a catastrophic experiment, which has wiped out the entire human race. Therefore, it is your task to populate the world again. Here you need sufficient resources such as food or electricity and gather people. Once you have achieved the population goal of 500 then you can move to the next city. Due to the multiplayer game style every city is different. Incidentally, there are benefits in terms of monuments for the city that give the entire population bonuses. These rewards you get with joint project. After you have completed the tutorial, you go directly to a city. Go straight to the Ministry of Labor to pick your first 20 trouble spots (experience points) and 2 Ration coupons. Here you already know the principle of starting. At people’s workbench you have to wait until your turn, this could take time. Here you have to solve a logic puzzle that is to build something. - Decide for spawn in the city. You are on an island, which is of course annoying - but you lose any resources in your inventory. - Wait for help from a fellow. If you with a friend, he can of course come to you and heal you. But other players see you lying on the floor and helping you that will cost you 25 hit points. In addition, parts of your inventory will be emptied - and everything in your backpack, so, for example, crystals, Matryoshka or fruit. - Heal yourself on the site. However, this will cost you a certain amount of freeman dollars. - In the game, you also can find a tent as a reward. Place it at a location to spawn there. Press the left stick (L3) in order to open the resource table. Here you can see quickly what resources are needed and how many people already living in the city. Every city needs coal, metal, crystal and wood. In addition, food and energy are essential. Losing one of the values to 0, your people will go to other cities. At the beginning you should definitely collect these resources and provide sufficient energy, food and houses. - Press OPTION button to go to title screen and select a new city. Here you have to build houses to provide accommodation to your people. - Increase your town in the levels, receive bonuses for all clones. Click triangle to see the effect. Propaganda increases example with flags or televisions. - Monuments are the success for all. The more you have installed it, the higher the town hall level. If you have enough metal in the material stock, the town hall can be expanded. Then you also get new items that you can build with the People's workbench. - Keep always in mind the time! If it is dark, you have to take a lamp, not to die. - The current mayor who is elected by the Residents. Click X to see which bonuses his rule brings. - Check out every now and again the energy consumption and food consumption. It coincides with the numbers you have to produce more of it. - Food can be produced with seeds from which grow trees later. For energy you have several options available. - Once you’ve reached the maximum number of houses of Projection clones. To build a house, you have to wait again until the population number has increased. It is also important to establish all 5 stalls so that the clones can be supplied with items. Izverg turrets are also necessary so that you can defend yourself. The puzzles for building at the workbench have a different level of difficulty per item. Especially the puzzles for the production of turrets are hard. Take a deep breath and try to solve them. If you cannot solve them, then you have to hire again or get freeman dollars to skip the puzzle. Don’t forget you to craft your ammunition. For the gun turrets, you get 100 rounds on all towers. - The metro connects all towns. Go there to go to cities of friends. If you want to change the city, you should look at the right tasks in the settlement. - Some parts of the void, you should not enter. Prefer to use the bus, a jetpack or skis. Also, you can use the black market to build bridges and other items also void items. A vibratory rammer must be purchased at the stall and build small platform. - Wood is an important resource that you need to fix something. Monster can destroy them. You should build immediately the building. Here you have the direction keys in the specified time, press, use the arrows. - Click in the building menu - the People's workbench triangle, you can see on the top right, which puzzles must accomplish it in order to produce the object. - Once you have you made it, you get a construction sign, which you have to place at the desired location. - You belong to the upper classes; you can build a house. To arrange this, select your upper class identity. Click for the right arrow from the D-pad then you just have to go to the place where you want to build your house and press square. - Go to the door of the other houses in order to move. Pay particular attention to the bonuses that give you clothes. This you recognize the stars over your attributes. - Press L1, you can whistle. Then you will briefly visible and audible to other clones.